Geeks. Nerds. Freaks. Freaks & Geeks. Simply put: They aren’t popular. We all know that. But does it matter? Or better put, is that necessarily a bad thing? Not according to reporter Alexandra Robbins, who argues that people who are interested in math, science and technology are the future of our nation (bonus points for obviousness). 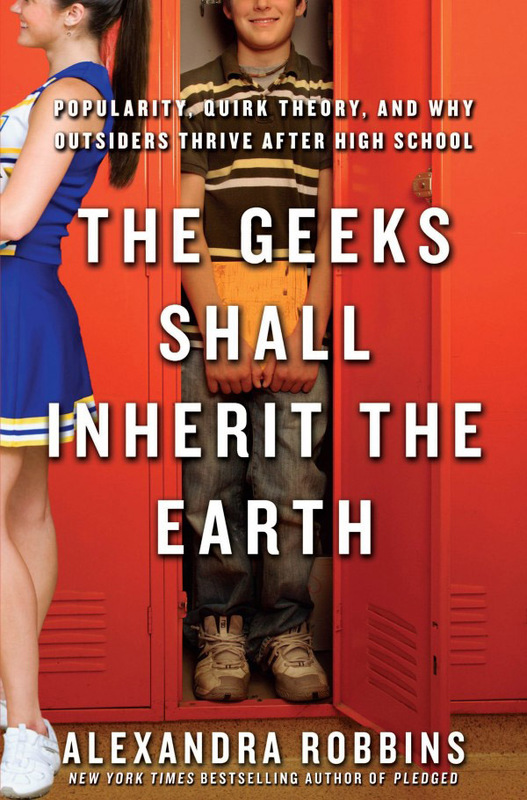 In her book Geeks Shall Inherit the Earth, Robbins profiles a number of unpopular individuals at public and private high schools for over a year. She claims that the very characteristics that make kids popular — including conformity, aggression, visibility and influence — do nothing to set them on the path to success or happiness in later life. The pro-nerd book gives hope to those who don’t confirm, as she argues this translates into success as an adult. By name-dropping celebrities including Steven Spielberg, Bruce Springsteen, Taylor Swift and Lady Gaga, Robbins manages to show how these self-professed outsiders have come out to become what society deems as extremely successful. “When you are in the popular crowd you are more likely to be conformist, you are more likely to hide aspects of your identity in order to fit into the crowd, you are more likely to be involved in relational aggression, you are more likely to have goals of social dominance rather than forming actual true friendships,” Robbins tells Yahoo. “You are more likely to let other people pressure you into doing things. None of those things is admirable or useful as adults.” As proof of this, Robbins notes that many high tech companies now favor hiring people who score as non-conformists and think outside the traditional box. While everyone can’t be famous, Robbins found that teachers specifically seem to find themselves fighting their way up the hierarchical chart in school just as they did as students. “They were saying that the teachers’ lounge is just as scary a place as the cafeteria, socially,” Robbins says. “If you get back into that setting, something about school can cause you to regress and care about popularity that way.” The book is filled with anecdotal stories of the vile treacheries acted out by “popular” cliques, as well as battle stories of teachers and the conformity they’re forced to mold to in their own workplace. If you feel like justifying your high school nerdery to yourself (and/or your kid’s), pick it up at Amazon for $13.